Electric Showers Introducing iShowers, the groundbreaking range of electric showers which contains an offering for everyone. 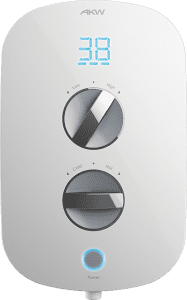 AKW SmartCare Plus is the world’s first Bluetooth ® Smart electric shower. With the ability to be activated via wireless remote control or iPhone app, it’s packed with market-leading features and technical innovations. It has unrivalled levels of control, ease-of-use and quick, easy installation, backed by a 3-year Warranty and all for an incredible price. iTherm combines style and intuitive design in a thermostatic shower. 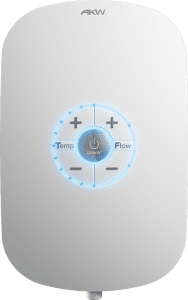 LED Temperature and Flow Indicators ensure the perfect thermostatically stabilised shower every time, with independent Temperature and Flow controls and Easy push Power button maintaining the settings for your next shower. Simple, stylish and safe for all the family. iSure’s clean white lines and high gloss exterior make this mechanical shower the perfect solution for replacement installations and when simple is simply the best. 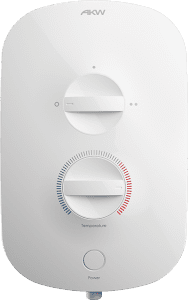 The easy push Power button, and white dials controlling Temperature and Flow, provide a minimalist look suited to all showering areas at a price suited to all budgets.